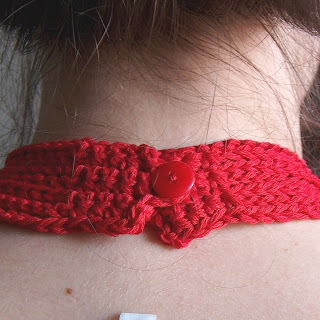 creativeyarn: Same pattern, different look! 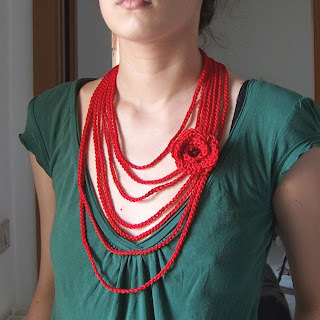 Here's another "crochet necklace" based on the same pattern, but with more and longer strands. This time the flower looks more like a rose or a poppy and it's fixed to a brooch pin on the back, so you can have it on or off the necklace! This pattern is really easy, but so versatile. You can change the number of strands or their lenght, and the result is always great and different. Thanks for stopping by my blog, hope you've found some inspiration for your works!